Pointed shoes, such as high heels and cowboy boots, can contribute to the development of hallux valgus. 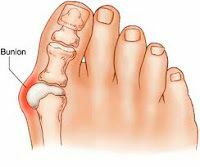 Abnormal foot function comes into play in the development of almost all bunions, and the most common abnormality is over-pronation or excessive flattening of the foot, easily correctable with an orthotic. In addition, hereditity can also be a factor for the cause of bunions. The symptoms of hallux valgus usually center around the bunion. The bunion can be painful. The severe hallux valgus deformity is also distressing to many, and becomes a cosmetic problem. Finding appropriate shoe wear can become difficult. Finally, increasing deformity begins to displace the second toe upward, and may create a situation where the second toe is constantly rubbing on the shoe. In some very mild cases of bunion formation, surgery may only be required to remove the bump that makes up the bunion. There are many negative stereotypes associated with bunion surgery. People have heard horror stories from grandma's and neighbors...well my friend, times have changed! It's not the same bunion surgery your grandmother had, bunion surgery does not have to be painful. The recovery time for bunion can be very short depending on your situation. Remember: The bunion is not going to go away...you need to treat it and the earlier you do, the less likely your bunion will require surgery!